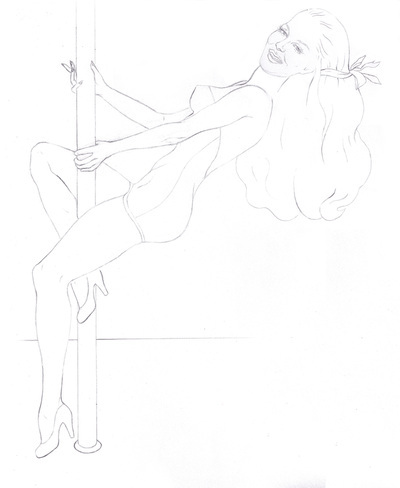 "Dance with Me" wine label sketch, 2010. Graphite on paper. 11 x 14 inches. 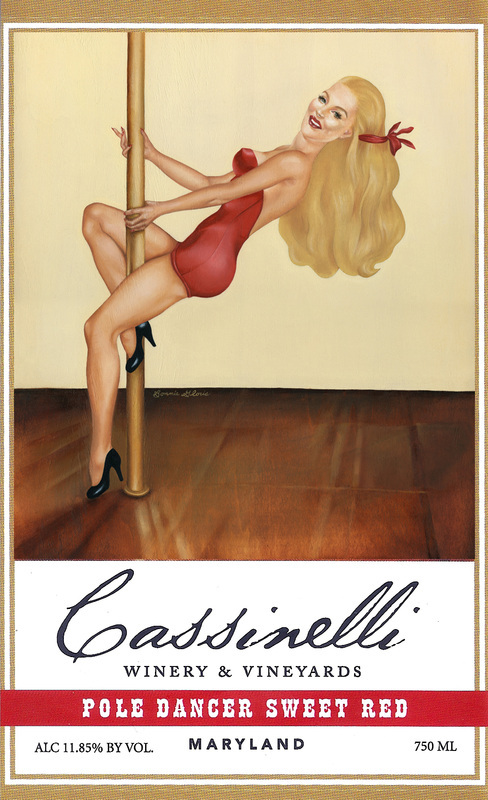 "Dance with Me" wine label, 2010. Oil paint on wood panel. 11 x 14 inches. "Dance with Me" wine label, 2010. 3.5 x 5.5 inches. 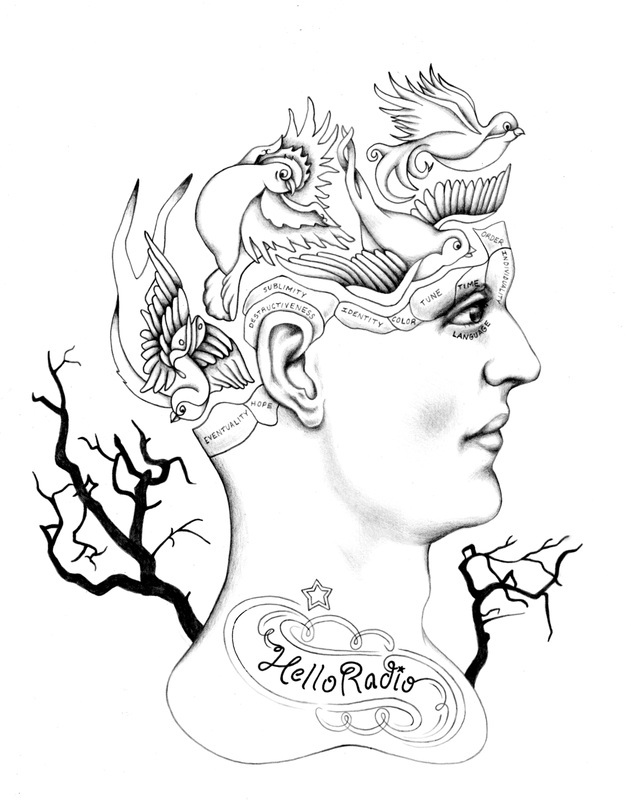 "HelloRadio" T-shirt Design sketch, 2013. Graphite. 12 x 9 inches. Original sketch submitted for t-shirt illustration, commissioned by the NJ/NYC-based indie rock band HelloRadio. 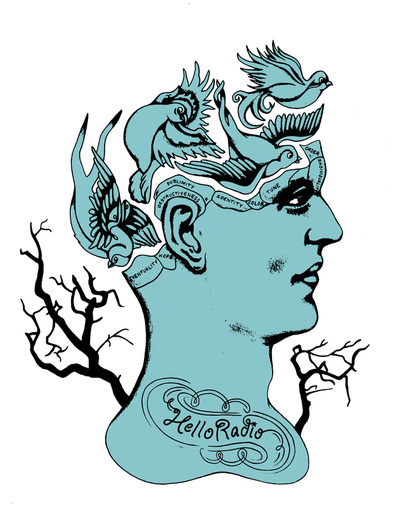 "HelloRadio" T-shirt Design with color treatment, 2013. Graphite, color added digitally. 12 x 9 inches. Four-color option submitted for t-shirt illustration, commissioned by the NJ/NYC-based indie rock band HelloRadio. 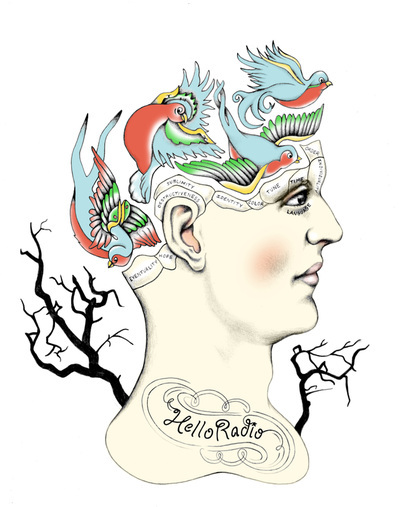 "HelloRadio" T-shirt Design, 2013. Digital. 12 x 9 inches. T-shirt illustration with hand-drawn text, commissioned by the NJ/NYC-based indie rock band HelloRadio. The design was drawn in graphite, then digitally manipulated and colored for a more graphic quality. "It's a Small World" presentation cover, 2008. Watercolor on paper. 9 x 12 inches. 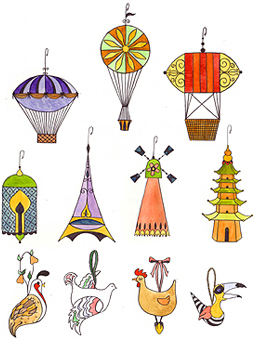 Drawings commissioned by DL & Co. for presentation pitching "It's a Small World" products to Barneys New York. 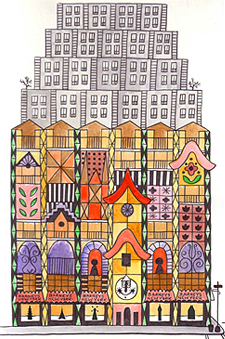 Cover depicts Barneys store with an "It's a Small World" inspired facade. "It's a Small World" ornaments, 2008. Watercolor on paper. 9 x 12 inches. 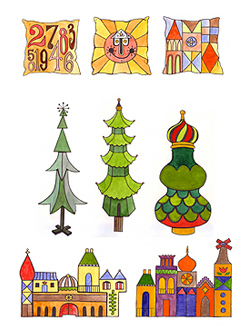 Drawings commissioned by DL & Co. for presentation pitching "It's a Small World" Christmas ornaments to Barneys New York. "It's a Small World" pillows and salt & pepper shakers, 2008. Ink and watercolor on paper. 9 x 12 inches. 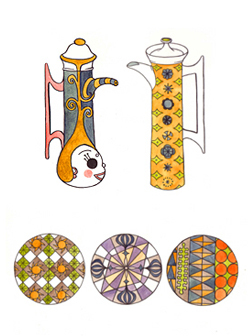 Drawings commissioned by DL & Co. for presentation pitching "It's a Small World" throw pillows, salt and pepper shakers, and cookie jars merchandise to Barneys New York. "It's a Small World" beer steins and dishes, 2008. Ink and watercolor on paper. 9 x 12 inches. Drawings commissioned by DL & Co. for presentation pitching "It's a Small World" beer steins and dinner plates merchandise to Barneys New York. Vanitas Product Proposal by DL & Co.
"Beetle" Vanita, 2006. White charcoal on paper. 11 x 8.5 inches. 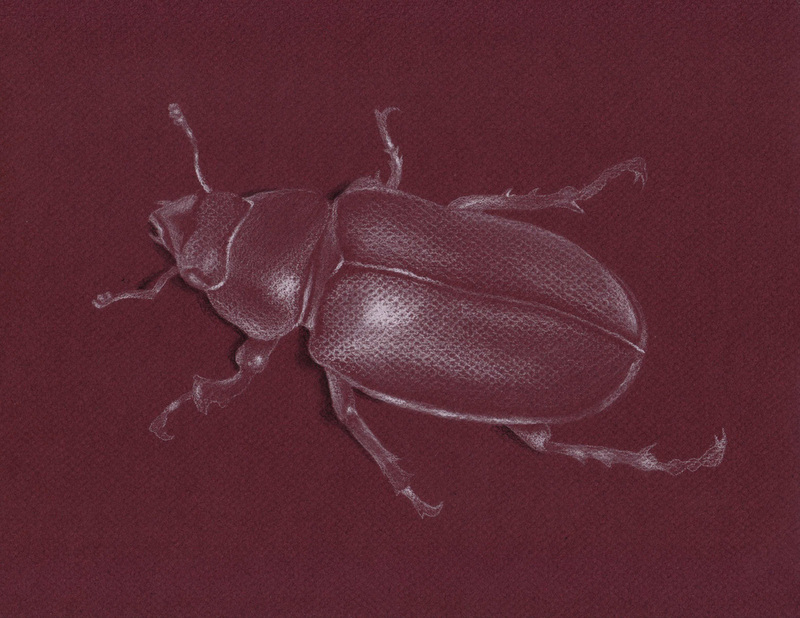 Beetle drawing, as part of a series of illustrations of Vanitas items commissioned by DL & Co. to be proposed to a manufacturer as porcelain objects. 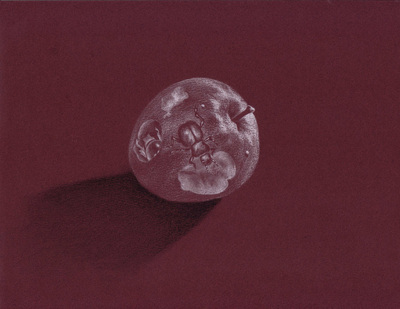 "Apple" Vanita, 2006. White charcoal on paper. 11 x 8.5 inches. Drawing of an apple infested with beetles, as part of a series of illustrations of Vanitas items commissioned by DL & Co. to be proposed to a manufacturer as porcelain objects. 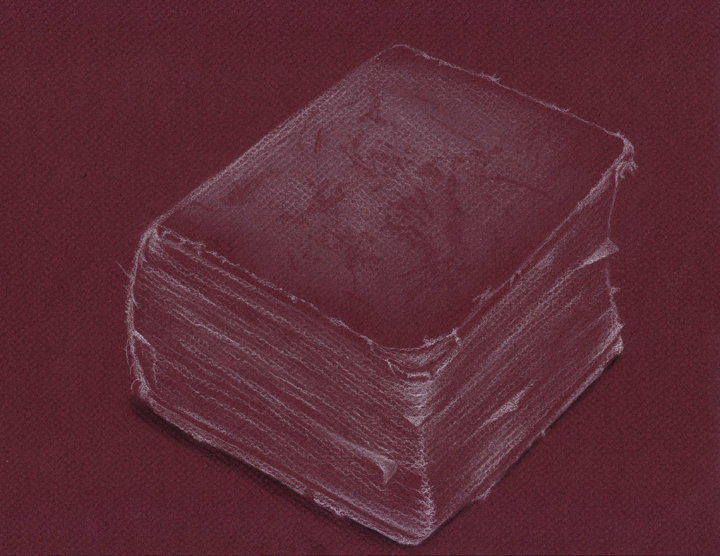 "Book" Vanita, 2006. White charcoal on paper. 11 x 8.5 inches. 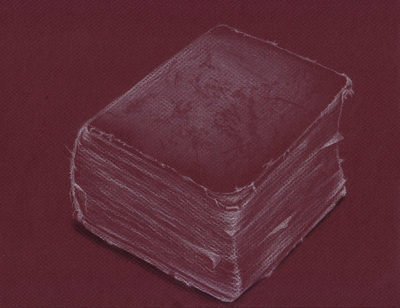 Antique book drawing, as part of a series of illustrations of Vanitas items commissioned by DL & Co. to be proposed to a manufacturer as porcelain objects. 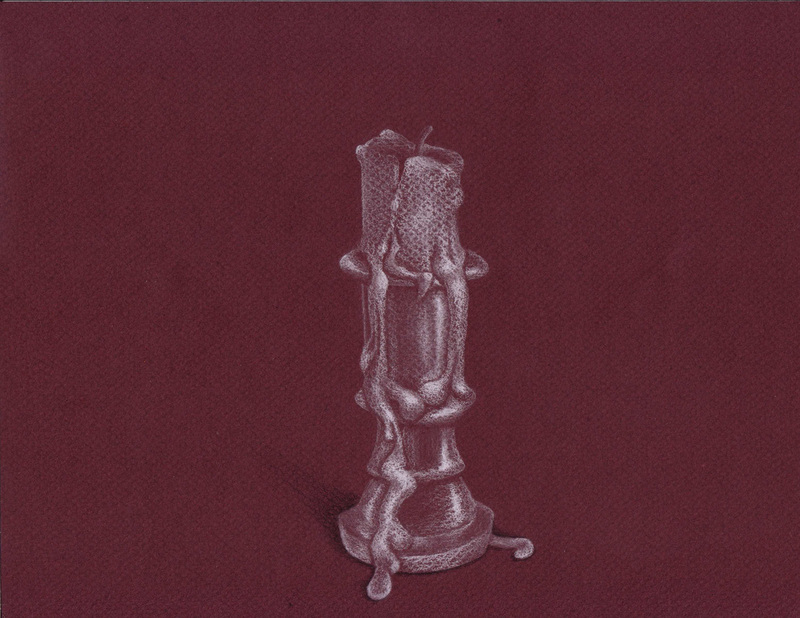 "Candlestick" Vanita, 2006. White charcoal on paper. 11 x 8.5 inches. Drawing of a candlestick with dripping candle, as part of a series of illustrations of Vanitas items commissioned by DL & Co. to be proposed to a manufacturer as porcelain objects. 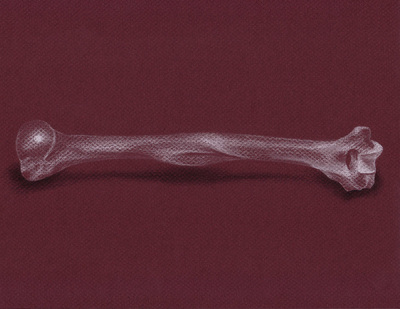 "Humerus" Vanita, 2006. White charcoal on paper. 11 x 8.5 inches. Humerus bone drawing, as part of a series of illustrations of Vanitas items commissioned by DL & Co. to be proposed to a manufacturer as porcelain objects. 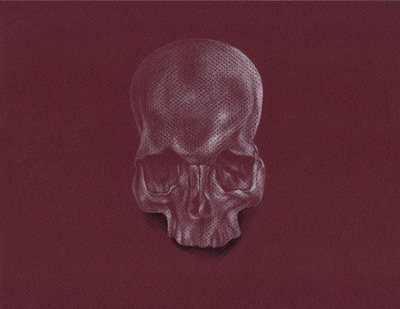 "Skull" Vanita, 2012. White charcoal on paper. 11 x 8.5 inches. Human skull drawing, as part of a series of illustrations of Vanitas items commissioned by DL & Co. to be proposed to a manufacturer as porcelain objects. "Bunny Love," 2009. Oil painting on canvas. 16 x 16 inches. Painting of two amorous rabbits, commissioned by DL & Co. for use on stationary and dishes.